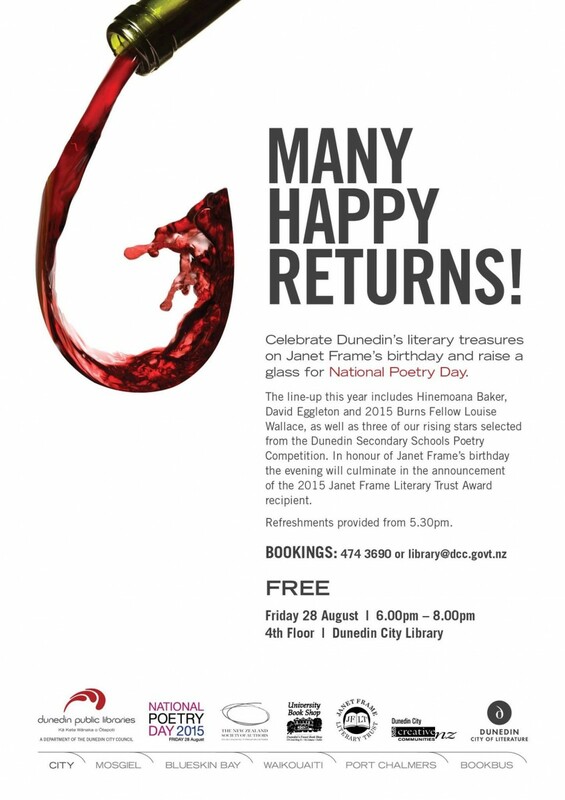 Celebrate Dunedin's literary treasures on Janet Frame's Birthday and raise a glass for National Poetry Day. How fortunate this year to be able to celebrate National Poetry Day on the occasion of iconic Dunedin writer, Janet Frame’s birthday. MC'd by Dunedin writer, Diane Brown, with readings from acclaimed New Zealand poets, Hinemoana Baker, David Eggleton and 2015 Burns Fellow Louise Wallace, as well as three of our rising stars selected from the Dunedin Secondary Schools Poetry Competition (www.writenow.org.nz), the evening will be rich in poetry. In honour of Janet Frame's birthday each of our guest poets will also be invited to read their favourite poem by the author, and the evening will culminate in the announcement of the 2015 Janet Frame Literary Trust Award recipient. Books will be available to purchase during the evening, courtesy of the University Book Shop. A UNESCO City of Literature event brought to you in partnership with Dunedin Public Libraries, the Janet Frame Literary Trust, National Poetry Day, the New Zealand Society of Authors and University Book Shop. Price: FREE and all welcome! There are 54 places available for this event.